Feel the coastal breezes from your private balcony when you spend a North Myrtle Beach vacation at Waipani. 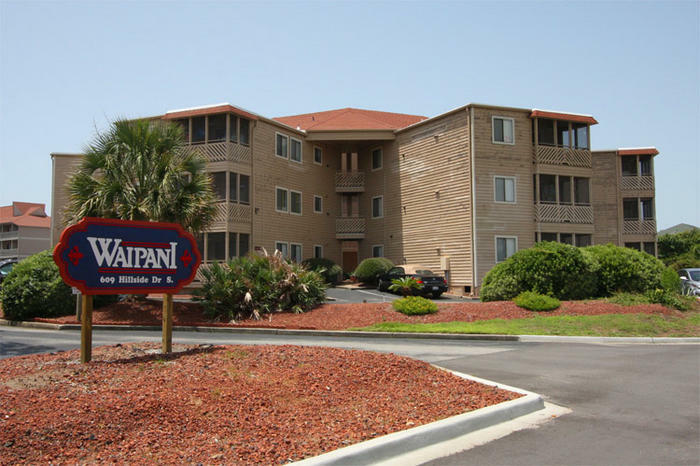 This North Myrtle Beach resort is across the street from the beautiful beachfront so you are only steps away from white sandy beaches when you stay at Waipani North Myrtle Beach resort. Each of these condos in North Myrtle Beach, SC has two bedrooms and two baths. All are beautifully decorated and will make you feel right at home. A full kitchen is tremendously handy when you want to quickly feed your family breakfast without having to go to a North Myrtle Beach restaurant. Furnished with a washer/dryer unit and a dishwasher, these North Myrtle Beach vacation rentals also have DVD players for your use during a memorable North Myrtle Beach vacation. Both are terrific ways to relax at this second-row North Myrtle Beach vacation resort. From the ocean view pool deck at Waipani you can readily hear the sound of the crashing waves coming to shore. So with a beach towel thrown over your shoulder and a book in hand, cross the street and walk along the sandy path that runs through the coastal dune line and out to the wide beaches and feel the North Myrtle Beach vacation sensation take over. Gorgeous sunrises color the North Myrtle Beach, South Carolina sky beautiful hues and you can have a front row seat to this stunning light show every North Myrtle Beach vacation day. For a different water adventure in North Myrtle Beach, South Carolina, visit the salt marsh where you can rent a kayak and paddle your way through the creeks where blue herons and white egrets quietly wade through the marsh. Or reserve a deep-sea fishing charter that will go out to the Gulf Stream where the fishing is amazing. A Waipani North Myrtle Beach vacation rental is the foundation of a terrific North Myrtle Beach vacation because it puts you in close proximity to all the amusements. Elliott Beach Rentals is not affiliated with onsite management or the HOA of Waipani.